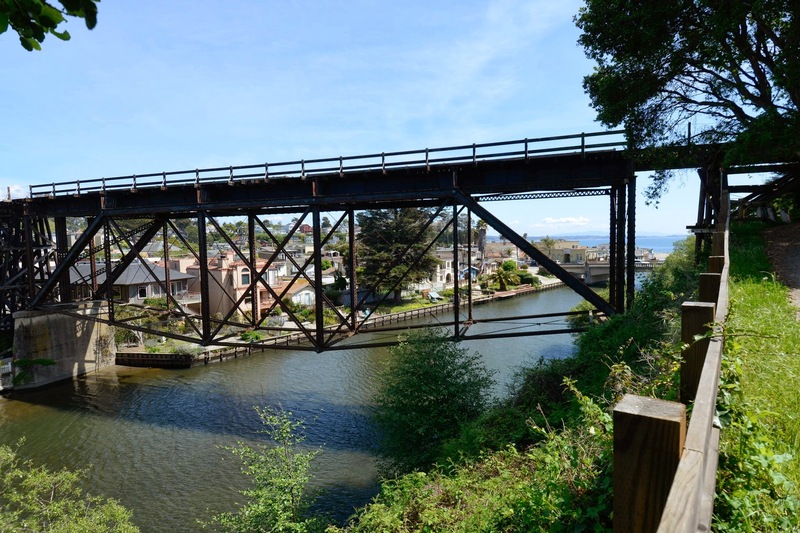 Following the Southern Pacific Railroad to the east we arrived in the town of Capitola and at an unusual Pratt deck truss bridge with a curved bottom chord. They must have had a compelling reason for building the truss under the deck: perhaps because the deck was so high and there was little ship traffic below. The truss span is 140 ft long and sits on pier walls at each end. There was discussion of this unusual bridge on the Bridgehunter Website. One writer called it a 'Fishbelly Deck Truss' and said that it was used when an existing substructure was reused but required a stronger (and deeper) truss in the center of the span. A narrow gauge railroad was being built across Soquel Creek in 1874 but this deep structure was probably a replacement for the original bridge, perhaps built at the end of the 19th century. The tracks and bridges are now owned by the Santa Cruz, Big Trees, and Pacific Railroad, although I don't believe they currently provide service into Capitola. Perhaps that's why people walk on the track with such impunity. Santa Cruz County, California Bridges: SCBG Railroad Bridge across Soquel Creek by Mark Yashinsky is licensed under a Creative Commons Attribution-NonCommercial-NoDerivatives 4.0 International License.